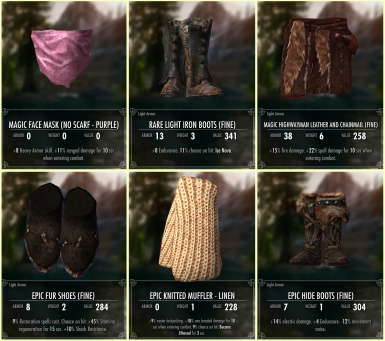 World's Dawn rewards your adventuring with a huge variety of unique and powerful loot to be found throughout Skyrim, and increases the depth of gameplay by introducing classic RPG attributes. You are allowed to modify this file or release a patch as long as you credit the original author and/or people whose assets I've been using, and don't upload your modification elsewhere but Nexus. Added compatibility check for "Corpse Preparation"
Updated legendary enchantments "Visions of Death" and "Archmage Regalia"
* Removed "Mass Absorb" and individual absorption of items from MCM, all items can now be dismantled in the dismantle window accessed via hotkey (default NUM0). Dismantling an item now grants an Augmenting Dust with a chance for an Augmenting Gem/Crystal/Stone, depending on your Personality and item's gold value. Should be compatible with Requiem and Ultimate Combat; new game is required! Added a visual FX for "Reflect Damage" and "Counterattack"
Replaced "On hit" with "On being hit"
The mod has a chance to enchant or temper any items in an npc's inventory, making fights more exciting and the loot much more useful. Enchanted and tempered loot can also be found in containers and chests. 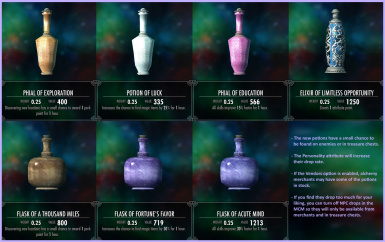 The enchantments are dynamically generated at random and no two items are exactly alike. You'll come across many brand new effects in your search for the perfect combination. If you're lucky enough to find that perfect item, you can increase its power further using the new Augmenting mechanic, absorbing power from unwanted items. There are new ways to customise your characters with seven attributes: Strength, Endurance, Agility, Dexterity, Intellect, Wisdom and Personality. Each attribute provides a small bonus to four different stats, so once you start stacking up the attribute points you can completely personalise your playstyle. You'll be able to increase your attributes when you level up, and boost them with enchantments from loot. * Distributes enchanted and tempered loot to friendly and hostile npcs as well as containers. Enchantments will be applied to any items an npc can equip, including mod items included in leveled lists. Drop rates and other settings can be altered in the MCM to balance the mod for your setup. Debug commands are available to customise the mod even further - see the readme tab. * Over 120 armor effects and over 50 weapon effects, selected randomly and combined to create a different enchantment every time. Includes passive bonus effects as well as active effects granting new skills that can change the way you play. 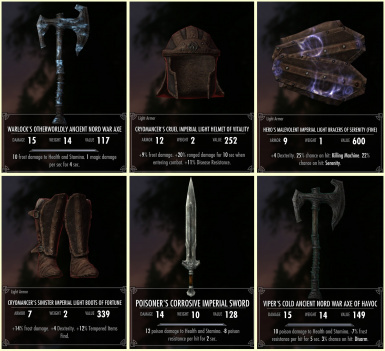 Check the images tab for examples of generated enchantments, and a few of the skills granted. The articles tab lists some of the effects (although not fully up to date). 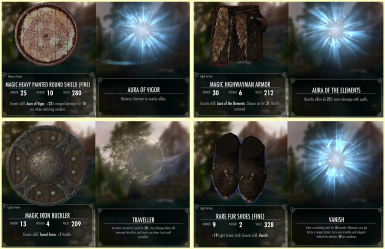 * Enchantments will be applied to any standard armor types (head, torso, hands, feet, shield, jewelry) as well as others added by mods (cloaks, left hand rings, face masks). Works with custom items from any mods that add the items to leveled lists; there is a chance to enchant or temper any equipment an npc spawns with. * Enchantment strength scales with the player's enchanting skill and the level of the npc it spawns on, so you'll keep finding useful equipment long into your playthrough and the strongest items will be found on the toughest opponents. Boss chests and containers with a lock level adept and higher will also have better loot. Loot also has four tiers - magic, rare, epic and legendary - which affect the number of effects and their strength. Legendary items are very rare and have unique effects. * Three options for renaming enchanted items: None ("Iron Sword"), By Quality ("Rare Iron Sword"), or RPG-style ("Conqueror's Virulent Iron Sword of Mind Rot"). * Adds seven classic RPG attributes that each add small bonuses to different stats.You gain two attribute points whenever yuou level up, find a standing stone or finish a main quest. You will begin with 5 points in each attribute and can also find equipment effects and potions that boost your attributes. "Attributes" MCM tab allows you to spend attribute points, and tooltips for each attribute tell you the exact bonuses they give. Points can also be spent via an in-game menu, assigned to a hotkey. The bonuses provided by attributes diminish as you increase your level. 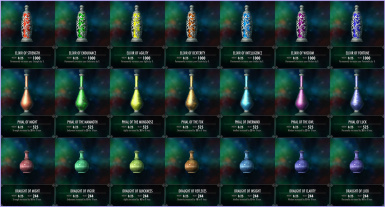 * New Potions can be found as loot or bought from alchemists. You will find elixirs that grant a permanent or temporary bonus to attributes as well as various other potions that will help you on your adventures. * "Character Overview" MCM tab lets you keep track of any changes to your stats so you can easily see all the bonuses from attributes and equipped enchantments in one place. Note that the overview doesn't take into account bonuses from perks. 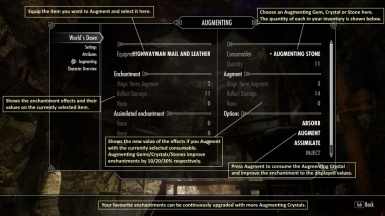 * New Augmenting system that allows you to indefinitely improve your favourite enchantments using augmenting crystals. You are limited to between 1 and 5 augmentations per day (configured in the MCM). Crystals have a small chance to drop as random loot, and can be created by dismantling other items. Bind a hotkey in the MCM to bring up the dismantle window and transfer any items from your inventory that you wish to dismantle. You will receive an amount of augmenting dust depending on the gold value of the items. You can craft augmenting crystals from augmenting dust at the smelter, and combine your augmenting consumables to create stronger ones up to the augmenting stone. An item can only be augmented once a day, and by default you can augment 3 items per day. 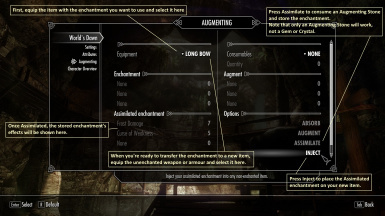 You can augment enchantments from this mod as well as your own player-made enchantments. However, you can't augment pre-enchanted items. To start augmenting, equip the item you want to augment and go to MCM > World's Dawn > Augmenting and select the item from the drop-down menu. If the equipped item can be augmented, its effect names and their magnitudes will appear below. Select an augmenting consumable from the second drop-down menu and the new effect values of that item will appear on the right side of the screen. Each consumable can increase the base magnitude by 10%/20%/30% respectively. 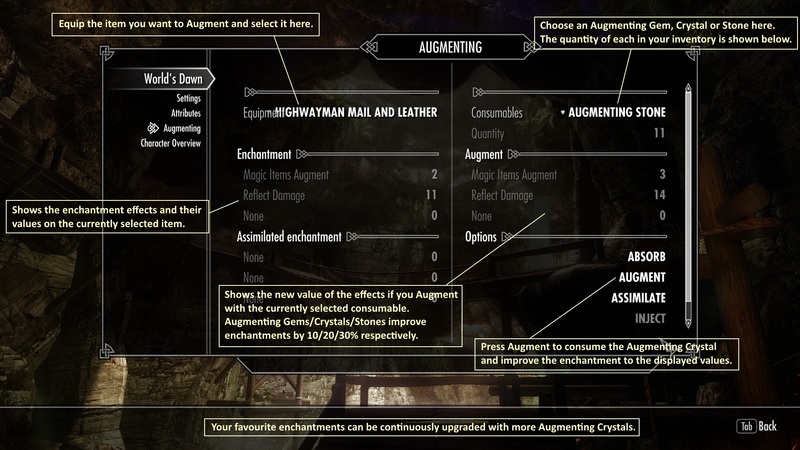 Once done with options, click on "Augment" and the selected item with improved enchantment is ready to use. 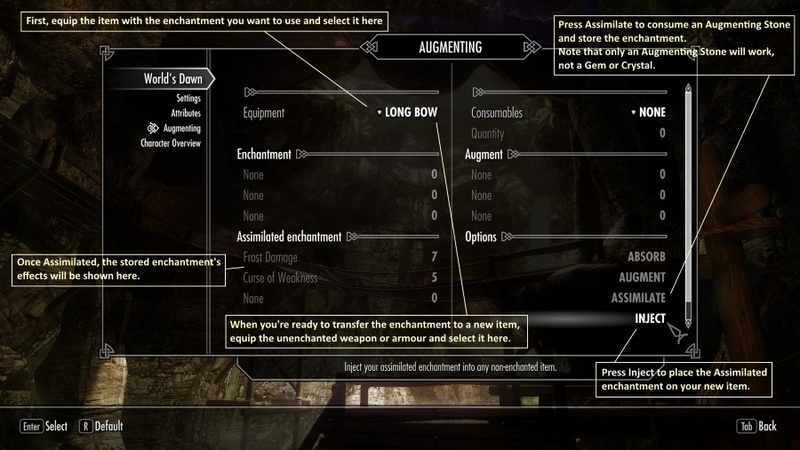 * Assimilation system that allows you to transfer an enchantment from one item to another of your choosing. Assimilation requires an Augmenting Stone (not a Gem or Crystal) and enchantments can be placed on any unenchanted items, including those added by mods. To transfer an enchantment, equip the item with the enchantment you want to use and go to MCM > World's Dawn > Augmenting and select the item from the drop-down menu. Press Assimilate to consume an Augmenting Stone and store the enchantment, which will then be shown in the menu ready for you to apply to another item. Equip the unenchanted item you want to enchant and select it in the menu. Then simply press Inject and the Assimilated enchantment will be placed on your new item. Strength is a very important attribute for a warrior, and increases the damage you are able to inflict with all weapons. Your powerful strikes cause your critical hits to deal more damage, and you are able to take more hits yourself with increased health. Endurance improves your chances of survival, providing damage mitigation and extra carry weight for your vital equipment. Your stamina is increased and will also recover more quickly so you can continue with your adventures. Agility is a useful attribute for a thief, allowing you to move more quickly, and you can perform power attacks at a reduced stamina cost to quickly eliminate your target. A marksman will also greatly benefit from agility with increased ranged damage, and your nimble movements grant you a higher critical hit chance. Dexterity is the ideal attribute for an assassin, increasing the damage you deal with one-handed and ranged weapons. You're able to take advantage of an opponent's weak spots, increasing the damage of your critical hits and power attacks. Intellect is essential for a mage hoping to master their powers, granting you a larger magicka pool whilst also increasing its regeneration rate. Your spells are more damaging and you're a fast learner, gaining experience more quickly. Wisdom comes with experience and you've learned to make the most of your abilities, gaining more magicka and casting spells efficiently with a reduced magicka cost. The items you will find are likely to be more powerful, and you've also learned how to protect yourself, giving you magic damage mitigation. Personality is a very useful atribute in an often harsh land like Skyrim, determining your inherent resistance to all weapons. Your charm gets you a better deal with merchants and you are able to make the most of opportunities with your uncanny luck, finding more gold and magical items in your travels. Summermyst - Enchantments of Skyrim - but is compatible with its predecessor, Wintermyst. * This mod is fully compatible with Ordinator, PerMa, Wintermyst, Requiem and Ultimate Combat as of version 1.10. * No leveled lists are altered so load order isn't important, and there's no need to include in your Bashed or SkyProc patches. * No item records are added or modified in any way, so it's totally compatible with any mods that add new items or change equipment appearance, stats, etc. (Compatible with Disparity, SkyRe, CCOR, Morrowloot, More Interesting Loot, and so on). * This mod is potentially incompatible with mods that utilize previously unused/obsolete actor values, listed below. If you know mods that do so, please let me know. and run the patcher. With this fix NPCs will benefit from the mod's specific effects, such as Damage mitigation or +% Electric damage. with various mods that add new or boost existing opponents (SIC, OBIS, etc. ), or make the game harder in any other way. 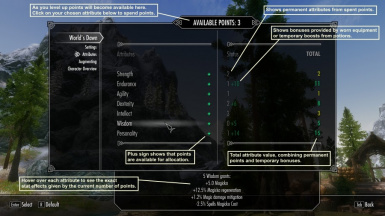 Using this mod with settings higher than the defaults without any additional difficulty mods, and especially without ASIS' NPC Enchant Fix, will most likely result in godlike dovahkilleverything early on, and it will not be this mod's fault, but your own. * In v1.11+ you may find enchantments with +0 magnitude, especially at the beginning of your playthrough. The vanilla effects description does not support decimal values, to figure out the effect's actual bonus check the "Character Overview", or simply select this item in the Augmenting menu.